From an online marketing point of view, one of the best lead management tools is ScopeLeads. It has quality leads with immense capability. In the case of SEO consultancy, it’s important you keep track of your clients and leads and it is the essence of the success of your business. 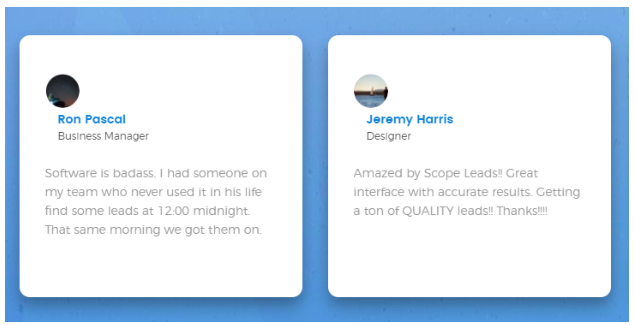 ScopeLeads lets you get to work with the people who really want your service. ScopeLeads helps you to find, track and connect with leads who are in need of your services. The difference between other tools and ScopeLeads is that it only finds leads which need your services. Once you track them, you can reach out to them with personalized emails. This tool handles your entire sales process from finding hot leads to connecting you with email outreach. What are the features of ScopeLeads? Finding businesses with poor rankings and on-page SEO has never been easier. Hit ‘SEO Lacking’ to find leads who need to improve organic rankings. You get location-specific searches which are performed using secure and trusted algorithms to get the most relevant leads. You can use ScopeLeads for as many searches as you like and lead unlimited campaigns to and you will not be banned by Google. Tracking your sales process is effortless and you also get to make use of digital audits. This will help make great first impressions by suggesting improvements for your clients. 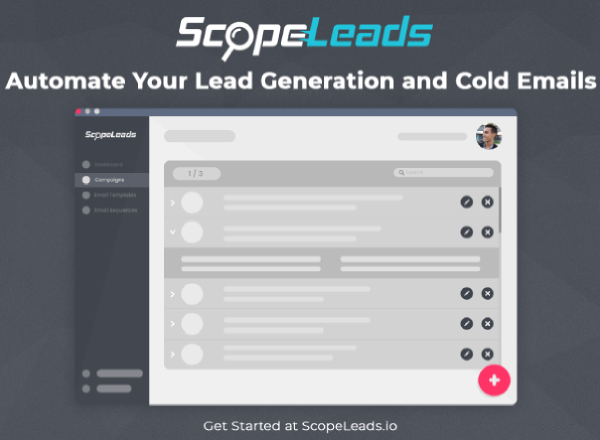 ScopeLeads makes your business easier by helping you find what the lead is lacking and you can send automated marketing emails to connect with your prospects for a strategy call. The track opens, clicks and sales with the help of their sales analytics in your dashboard. You can check the statistics of individual leads and campaigns. You can set up and keep track of campaigns in specific-geographical areas. All you need to do is enter keyword and location. Select whether you are scouting for businesses which need social media or SEO related assistance. Search and ScopeLeads will give you all the details in your niche. What are the advantages of ScopeLeads over other similar software? Find leads without research in less than 5 minutes. Finding the right leads will help you earn more since they will be willing to pay for your services. Strategy calls and consultations in one-click. Track your entire sales process effortlessly. With this plan, you can run unlimited searches, store unlimited leads and send unlimited emails. You get all of Lite’s features in addition to Auto-run mode, bulk sending of emails, additional types of searches and follow-up drip sequences. You get everything in Pro with deeper email lookups and 2 sub-users allowed. However, this is not yet available and the plan is coming up soon. You can cancel your subscription at any time from within your profile. You can also write to us at [email protected]. They have a 30-day money back, no questions asked policy. Most customers who have used ScopeLeads have loved what it has to offer. We bring you some of their clients’ testimonials which show how it has helped several businesses improve with more leads. With ScopeLeads at your disposal, lead management has become much easier than ever before. You can spend your valuable time over other aspects of improving your business. ScopeLeads takes you further away from any other lead manager in serving leads in your niche with your wonderful services/products. It is easy to use and everything can be done in a couple of clicks.